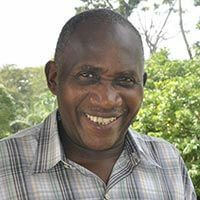 Edward Kanju is a cassava breeder at IITA based in Kampala, Uganda. His research is focused on developing new cassava varieties that combine dual resistance to Cassava Mosaic Disease (CMD) and Cassava Brown Streak Disease (CBSD) for the eastern African region. Dr Kanju obtained his Ph.D. in Plant Breeding from the University of Free State, South Africa. He was by then employed by the Ministry of Agriculture, Food Security and Cooperatives, Tanzania. His research background includes cassava and sweet potato improvement especially developing new varieties that combine resistance to major biotic and abiotic stresses along with end-user-preferred characteristics. He has been supervising several projects in East and Southern Africa in collaboration with NARS in Burundi, DR Congo, Kenya, Mozambique, Rwanda, Tanzania and Uganda.